I'm pretty sure sleep is the magical unicorn that all parents chase. We definitely take sleep pretty seriously around here. I've joked that Amazon's purchase history between the hours of midnight and 5am are primarily by desperate moms hoping a sound machine, just the right swaddle, or a new swing will be the cure-all. I, for one, have most definitely not shopped half awake out of desperation. Definitely not. 1. A dark room. You NEED blackout shades. 3. A consistent bedtime routine. 4. A cozy sleep environment. 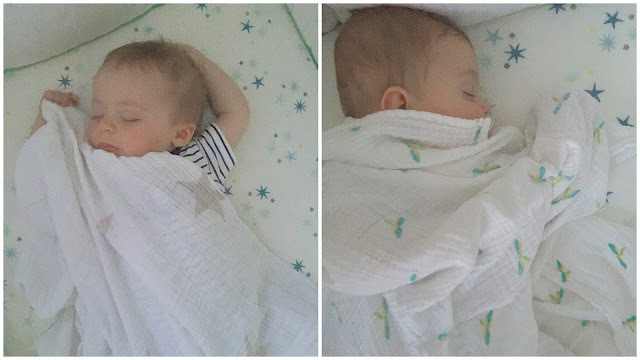 In my book, a cozy sleep environment means: a quality mattress, soft linens, cuddly pajamas, a comfort object (lovey/blanket) and a durable crib. 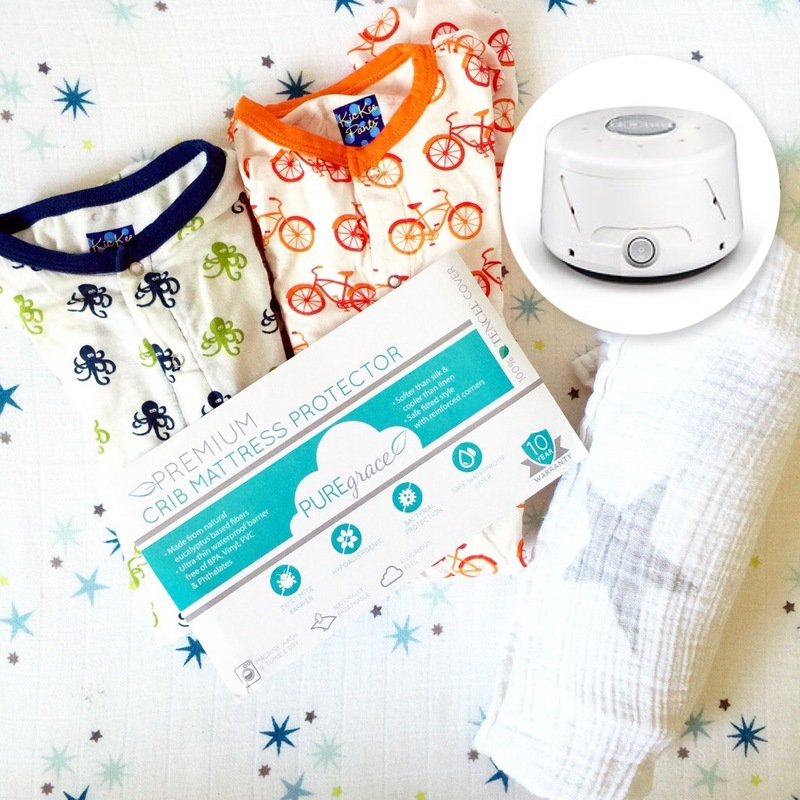 So, when I was given the opportunity to try and then review a PUREgrace Premium Crib Mattress Protector I jumped at the chance to add another element of comfort and protection to the twins' beds. With all the mess around here, mattress protection is a no-brainer. The PUREgrace mattress protectors is how amazingly silky soft and high quality they feel. It's almost a shame to put sheets over them! According to the PUREgrace people: it's made of a product called Tencel that's a botanic and pure fiber derived from Euclyptus trees, found in nature, grown free from pesticides and herbicides, and harvested through an eco-friendly manufacturing process. Who wouldn't want their sweet little ones sleeping on that? The other thing that's really fantastic is the security with which they attach to the mattress. The mattress protectors are very deep and have a series of elastics that keep them extremely secure. I appreciate not losing any sleep worrying about anything coming loose. The PUREgrace mattress protector is a luxurious and high quality product. Honestly, it's not something I had thought to purchase, but I absolutely love having these! What are your sleep essentials? via the Savvy Sassy Moms Product Scouts Program! Raising 3 kids under 3 isn't a small thing. I've learned that over and over in the past 6 months. But I'm not a hero. When I leave the house with the kids, I get flooded with comments, stares, and praise. A big double stroller with a toddler riding in tow is certainly hard to miss. "Go mama! I don't know how you do it!" "Better you than me. I'm overwhelmed just looking at you!" "I can't believe you get out!" "You are my hero, mama!" I appreciate the compliments. I'm proud that I feel capable of taking our kids out. And yet, sometimes I feel something else. I'm not sure of the word. It's not exactly embarrassed. Maybe undeserving? I mean, the reality is this: This life is exactly what I signed up for. Literally. I physically signed a paper to transfer to strong, beautiful embryos to my body with a 18 month old baby at home. None of this was a surprise. I dreamed of it. I cried for it. I wished with all my being that I would have the opportunity to raise a family. It's a lot of work, and planning, and coordination. Getting out of the house often feels like a 3-ring circus. Bottles, diapers, extra outfits, snacks, toys...it's an entirely different level of effort than tossing a baby in the stroller and heading out for a few errands. But like I said, I signed up for it. And I love it. Today I'm not showered. I am wearing clothes I grabbed off the floor because I got barfed on this morning. I honestly couldn't tell you what I've eaten today besides animal crackers and coffee. I'm definitely not a hero. But I love these kids like crazy. Most days I do my best. Many days I fall short. And that's that.